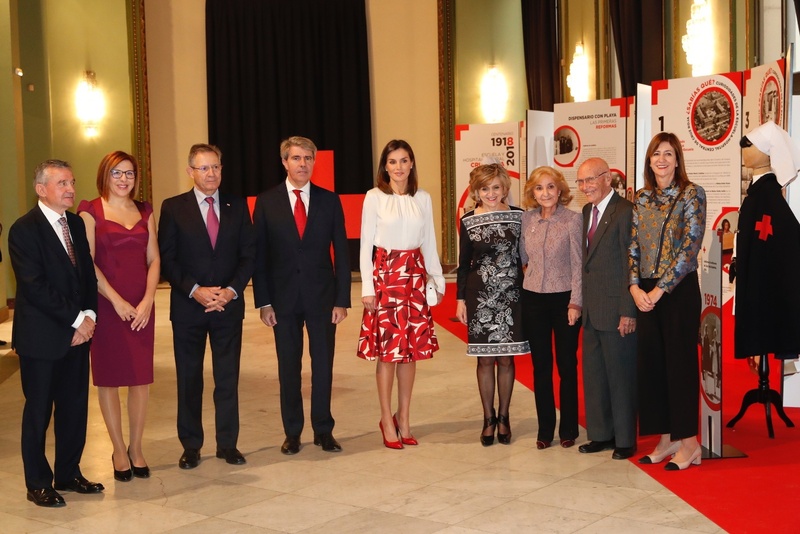 On Tuesday, Queen Letizia of Spain continued her weekly schedule with a visit to Red Cross San José and Santa Adela to celebrate the centenary of its School of Nursing and the Central Hospital at Fine Arts Centre in Madrid. The School of Nursing and Central Hospital Red Cross celebrated its 100th birthday of service. 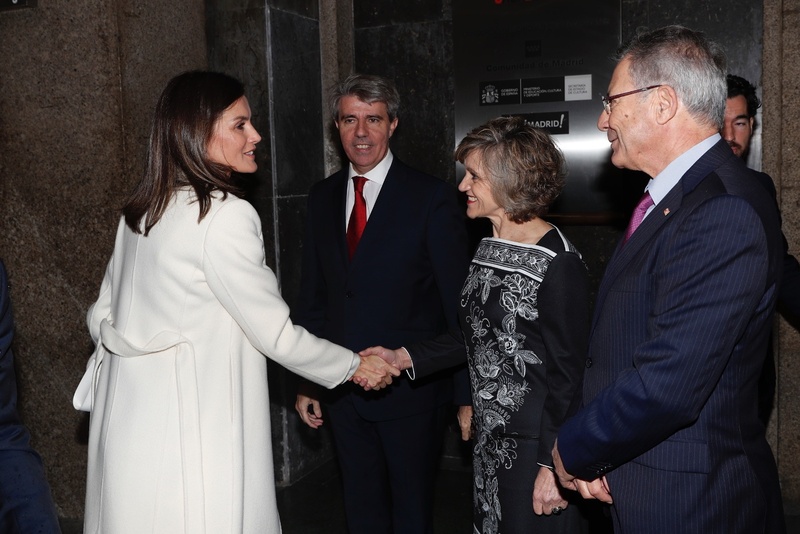 Upon arrival Queen was received by the Madrid Community President and Minister of Health. The hospital was built between 1893 and 1908 and was named Casa de Salud San José and Santa Adela as a tribute to who donated the funds for its construction. Its first board of trustees was formed in 1913 by Queen Victoria Eugenia. 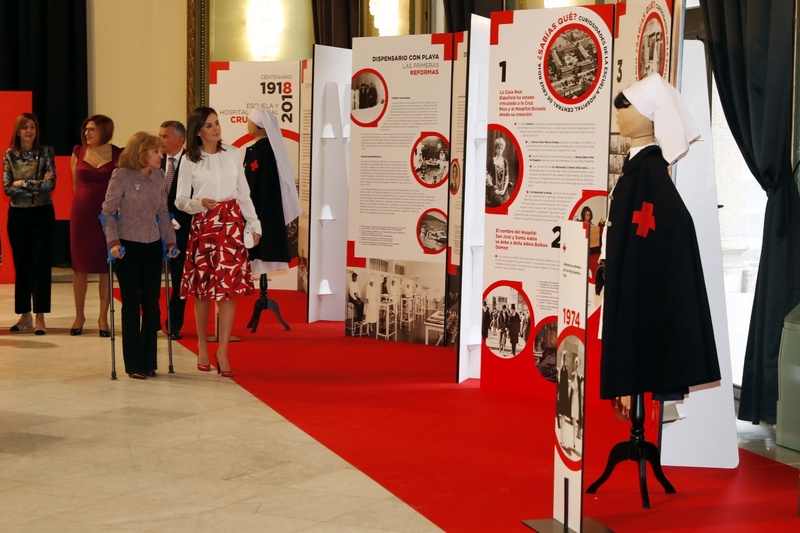 In 1918, a Royal Decree confers the Hospital to the Spanish Red Cross. 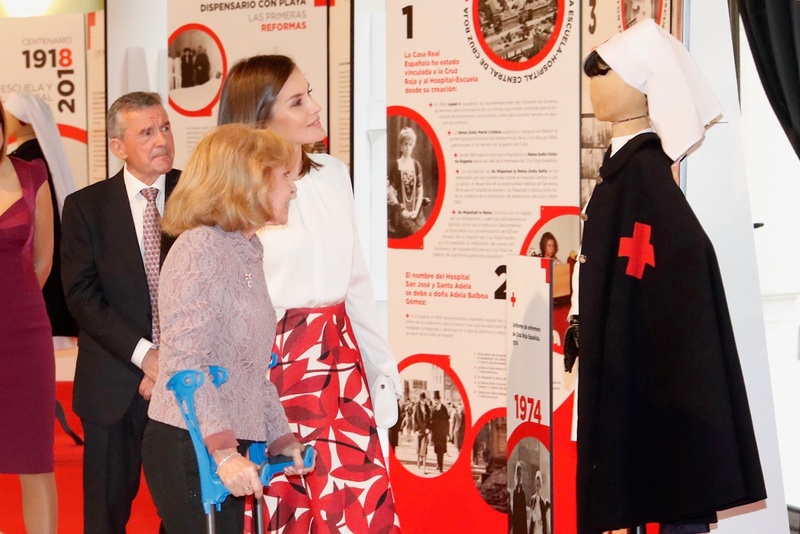 At the Fine Arts Centre, Queen toured the facility that was hosting an exhibition commemorating the centenary of the School of Nursing and the Central Hospital of the Red Cross San José and Santa Adela. 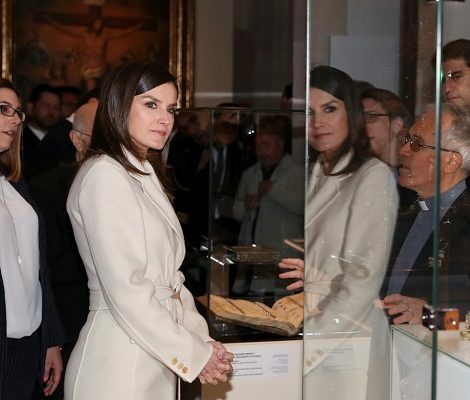 Queen Letizia during the tour of the exhibition. 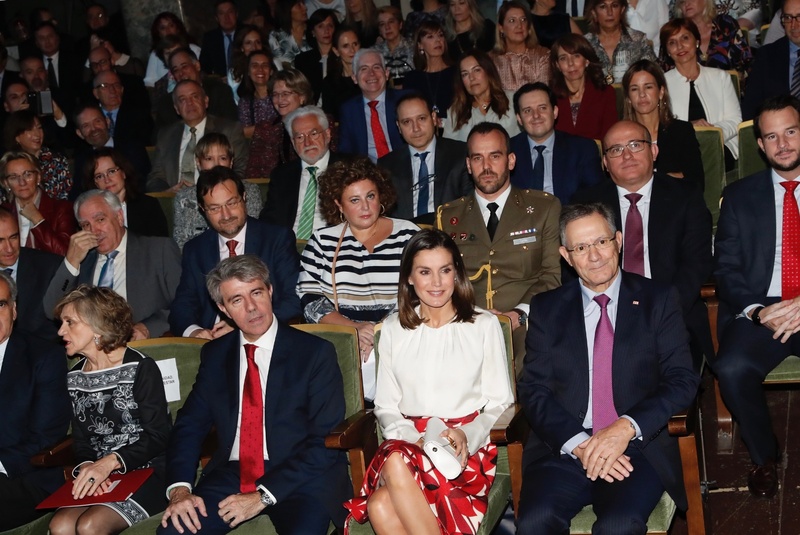 Next Letizia watched a video presentation at centre’s Fernando Rojas theater about the Hospital-School that included testimonies of patients and workers of the Centre. The day ended with an act in which a student performed the basic conversational activity of the Red Cross . 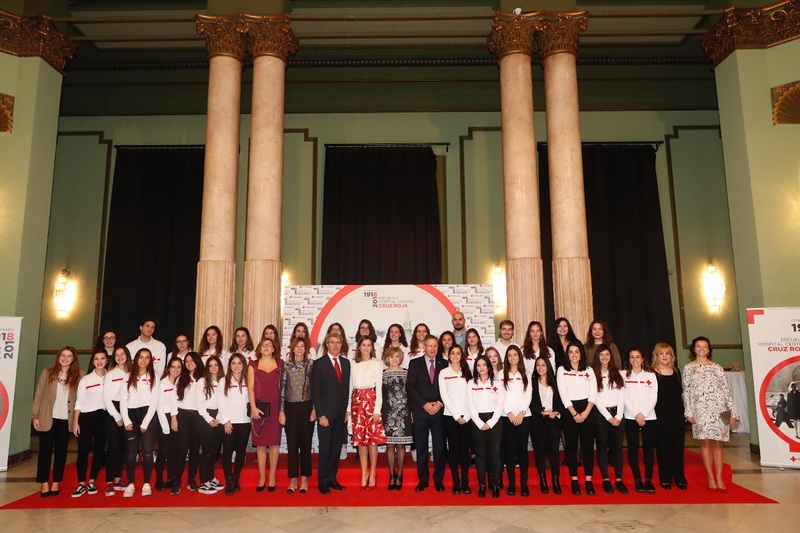 Letizia with students of Nursing School. 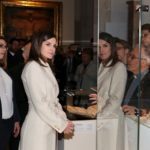 For the visit, Letizia chose an outfit having her favourtie colour combination – Red and White , also a colourful nod to the Red Cross. 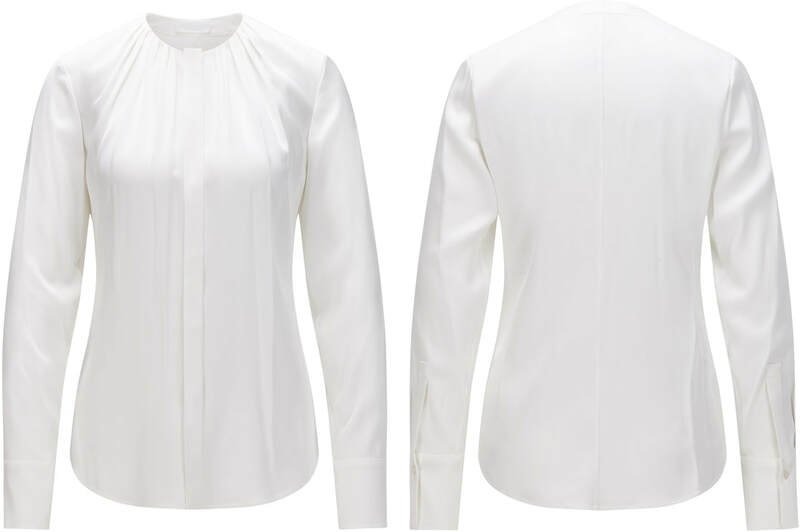 She wore a white silk-satin Banora blouse from her trusty label Hugo Boss. Debuted in 2015, the round neck top is straight-cut in flowing silk-satin. Its carefree, delicate look is achieved by the finely pleated arrangement at the neckline and concealed button placket. Queen also owned the same model in purple hue. She paired it with red Carolina Herrera skirt. 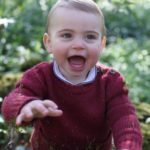 Queen first wore the printed skirt in December 2017 at AECC meeting then at an audience at Palace in March this year. The skirt features white, red and black abstract print on red base and carefully placed pleats and button detailing on one side. 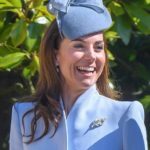 Upon arrival Queen was wearing her cream wool-crepe long coat that we saw yesterday during National Museum of Prado visit. She was wearing her red leather pumps from Felipe Varela that she has in her wardrobe since 2007. 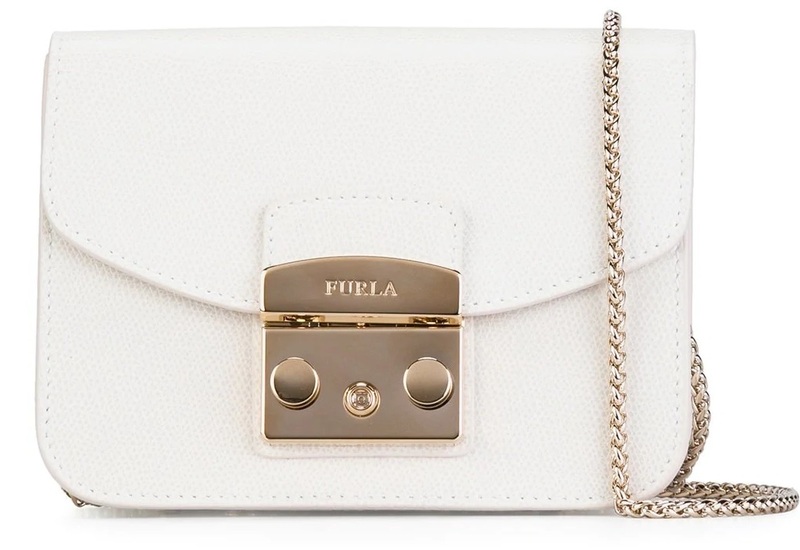 Queen was carrying her white Furla Metropolis mini cross body bag, that she premiered in Peru last week. The petite size of the $256 bag adds a stylish delicacy to the design which features a fold over top with clasp closure, gold-tone hardware and a chain shoulder strap. The bag is also available in black, pink, red and many other colours. She finished her look with simple white pearl studs from TOUS. The Silver Bear $89 studs have cultured freshwater pearls set in white gold. They are currently available on TOUS USA online store. 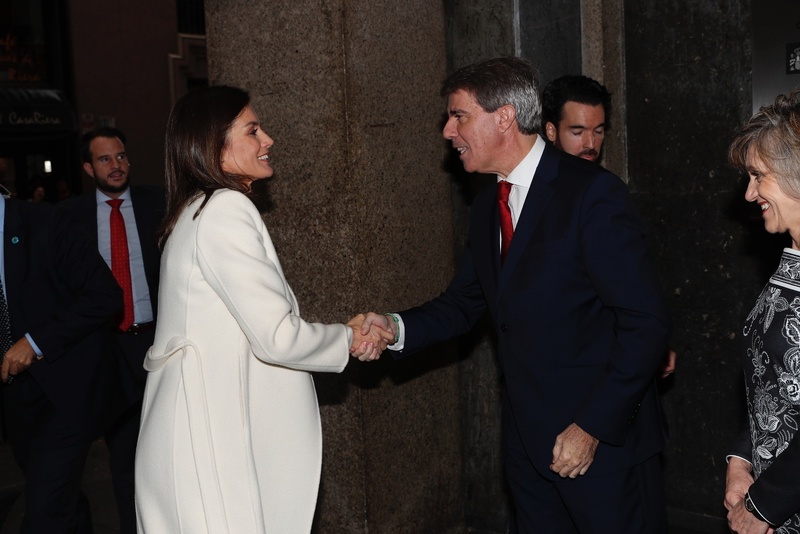 Next we will see Letizia on Friday when she will preside over the BBVA Interga Awards.